With nearly 200 unread books lying around on shelves, eReader and iPod it takes a lot to get me excited about a new release these days. Especially as, living in Australia and not owning a Kindle, I am rarely prepared to shell out the $33 a new release will cost me (in print or eBook format). But I must admit I am getting that tingly feeling about a book due for release here (and the rest of the world I think) at the end of the week (officially Sunday though as there are no deliveries then I am hoping to snaffle a copy on Friday which I can read while everyone else is watching some silly wedding). In 1665, a young man from Martha’s Vineyard became the first Native American graduate of Harvard College. From the few facts that survive of this extraordinary life, Brooks creates a luminous tale of passion and belief, magic and adventure. a restless spirit and a curious mind, Bethia slips the bounds of her rigid society to explore the island’s glistening beaches and observe its native inhabitants. At twelve, she meets Caleb, the young son of a chieftain, and the two forge a secret bond that draws each into the alien world of the other. in a society that requires her silence, she also becomes entangled in Caleb’s struggle to navigate the intellectual and cultural shoals that divide their two cultures. I’ve really enjoyed most of what Brooks has written in the past (Year of Wonders is one of my all-time favourite books even though I absolutely hated the ending) so I’m reasonably sure that it won’t be a dud. Once upon a time I would have waited until the price comes down but given I spend a lot of leisure time hanging out in the book blogosphere I don’t think I’d be able to avoid seeing other people’s comments and reviews about the book for too long, and it’s one of those books I want to read without being encumbered by other people’s thoughts (I’m one of those strange people who likes reading reviews after I’ve read a book). 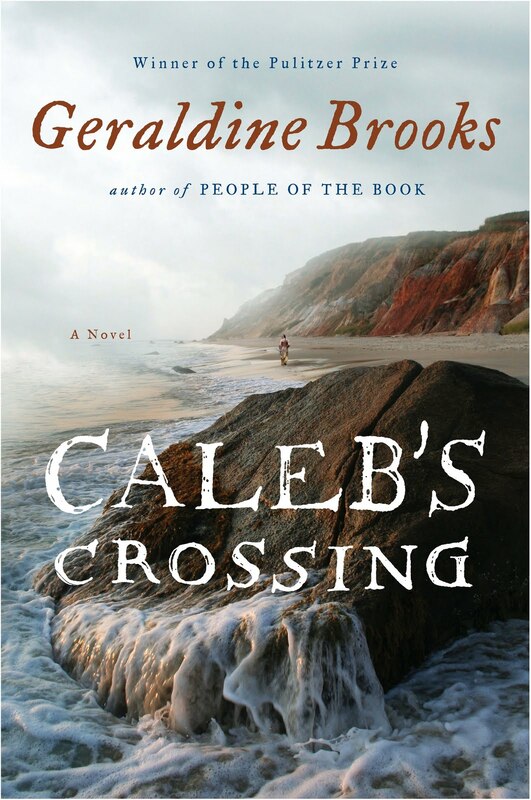 So, depending on when I manage to get my hands on Caleb’s Crossing, I’ll be taking a break from crime fiction in the next week or two and am really looking forward to reading what world Brooks has managed to create this time. Is there a particular author’s work that gives you that tingly ‘must get hands on new release’ feeling? Or do you routinely buy new releases and are therefore immune to the tingly feeling? Is there a book you’re really hanging out for in the next little while? This entry was posted in Geraldine Brooks (Aus), musings. Bookmark the permalink. I was meant to be getting an ARC of this one, but it hasn’t turned up. Even if it does I will be buying this one as I am going to an event where she is being the special guest in June, so I feel like I have to at least buy the book! Looking forward to it! @Marg I’m surprised you didn’t report a stabbing pain in your kidney as I put little pins in a marg-themed-voodoo-doll when I saw that you are going to that event 🙂 She ain’t coming to Adelaide and is one author I would like to meet (I’m not normally terribly into that kind of thing but I have been reading her stuff since her foreign correspondent days). Is that what that pain was! It’s a shame she isn’t going to Adelaide. Hi,if you’ve never read Kate Atkinson,you should give any of her books a try.Her stand-a-lones are wonderful,and her Jackson Brody ones are clever and excellent. I get all tingly for Jo Nesbo and Colin Cotterill’s work. I would actually buy the print books for both those authors if I couldn’t get it digitally. I can’t think of anything that I am counting down the days to read…oh wait. Johan Theorin’s The Quarry in the UK. Hey! I thought I was the only one who liked to read reviews after too! Actually, I always get tingly for Tim Winton, you know that, but I hated Breath so I hope his next is both soon and better. I was eager to get the new Murray Bail, but I have it and haven’t even started it…it was the conquest apparently. I am excited about a new author (to me), Connie Dial. I was sent an ARC of her latest book ‘The Broken Blue Line’ an LA cop procedural, and I really liked it. Best in awhile, so now I get to look for her previous book and hope it’s as good. I like Henning Mankell too for new books, but I’m also hankering for a new book by Stig Saeterbakken from Norway. Let us know if you end up spending big coin on this book! I expect the first review from you!